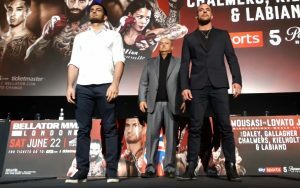 Bellator MMA rolled out the red carpet in Leicester Square for a clutch of its fighting stars at the Odeon this week to publicise event 222: Mousasi vs. Lovato on June 22 at the SSE Arena Wembley. Coker read it as a hint that ‘The Warmaster’ wanted to be on the blockbuster summer London card. In a 43-fight career, Barnett has never fought in the UK. The headline event will feature middleweight champion Gegard Mousasi, well-known to the UK and making his fifth appearance here, will put his title on the line against undefeated Rafael Lovato Jr. in the main event. Lovato admitted to me that he is “stepping up” but feels “ready” against a champion – Armenian, born in Iran, but now Dutch – who makes very few mistakes as a magician at MMA. It was also announced that Paul Daley will face Erick Silva in what should prove to be a war of a welterweight contest, while the rising young star in Ireland James Gallagher will face Jeremiah Labiano at featherweight. Former reality TV star Aaron Chalmers and former six-time women’s world Muay Thai champion Denise Kieholz will also be on the card, though their opponents are yet to be confirmed. The former Geordie Shore star Chalmers revealed to reporter Wally Downes Jr that it had been a rough time since his first defeat in his fifth fight to Corey Browning – with sick Twitter trolls urging him to suicide. The 31-year-old Bellator fighter had been heartbroken after losing a close contest by submission with Browning in front of his home Newcastle crowd on February 9, bringing to an end his four-fight winning streak. Chalmers, who battled anxiety after the loss, said: “Initially, after the fight, I could not watch it back because I was that embarrassed. It looked like I went in there having never trained in my life. “I was apologising to everyone backstage, while they were trying to tell me ‘well done’ because it was f***ing shocking. I keep tabs on my social media accounts but I seem to always overlook the good and get drawn to the bad,” Chalmers explained. “I was getting messages saying ‘why don’t you just kill yourself? But if I kill myself then who will these people have a go at? Daley, meanwhile, has dropped three of his last four fights inside the cage. In his last outing in the USA in a highly anticipated match-up with Michael Venom Page, he was defeated via unanimous decision. His opponent, Silva, returns after a submission victory over Steven Graham. Gallagher faces Labiano, who won three of his past four fights, his latest being a September first-round TKO over Justin Smiley. Bellator president Coker also announced that the promotion will launch a featherweight grand prix in October. The tournament will feature 16 of the best 145-pound fighters in Bellator, the biggest tournament to date, while teased further ‘major announcements’ next week in the United States. That is expected to be confirmed later this week. Coker revealed that the tournament will begin sometime in October with the full first round — eight fights — on a single card. It will air on DAZN. The plan, he said, is to finish up the grand prix “within a year”. It was not made clear whether the Bellator featherweight champion, Patricio Freire, will be in the draw. Freire moves up to lightweight in a Champion vs Champion contest against Michael Chandler in the main event of Bellator 221 on May 11 in Rosemont, Illinois. Gallagher also told me yesterday that he would “prefer to be free” to fight in the 135 and 145 divisions and may not sign up for the tournament, intent on headlining a Dublin card in September. “Even London will be ‘The Jimmy Show’, you watch,” he told me. But it was a wild and wacky day in the world of fight sports. Nothing new there, of course. In New York, at Bare Knuckle FC’s media day at Mendez Boxing to publicise a bare knuckle fight between Paulie Malignaggi and Artem Lobov, they nearly came to blows. The former world champion boxer Malignaggi slapped the face of Lobov, the training partner of Irish MMA star Conor McGregor, with a near brawl needing to be quelled. "I just kicked him right in the f*cking chest to let him know what's up." Artem Lobov (@RusHammerMMA) 🐐 tells @MikeBohnMMA his side of the story on the near-brawl that went down with Paulie Malignaggi at #BKFC5 media day. Even McGregor went at it with arch rival Khabib Nurmagomedov, after the Russian who fought and comfortably beat McGregor in the UFC last year, expressed scepticism at his opponent’s decision to leave the sport last week. “Conor acts like a jealous wife, who says ‘I will leave’ all the time but then comes back,” the Russian said in response to McGregor’s tweet. Never a dull day in fight world.